With patients' needs at the heart of everything we do, our website has been designed to make it easy for you to gain instant access to the information you need. As well as specific practice details such as opening hours and how to register, you’ll find useful pages covering a wide range of health matters along with links to other relevant medical organisations. 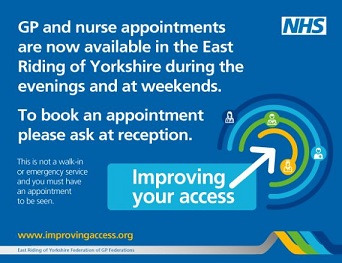 We have Open Access surgeries every weekday (Monday to Friday except Bank Holidays) so you are guaranteed to see a doctor on the day of your choice, without having to wait for an appointment. There are some appointments that you can book with the Nurse for cervical smear tests, click the button below. There are also some appointments you can book to see the GP out of surgery hours, please ask at reception. To view a summary of your medical record online, click the button below. Register with the surgery & then click the button below to order your repeat prescriptions online.